How Minimum the Wage, How Negative the Tax? Israel’s minimum wage is among the highest in the West, but lawmakers want to raise it further. On the other hand, the country’s negative income tax is very low compared to the United States. Israel already has some of the highest rates of non-employment in the western world. Its high rates of poverty and inequality have led to demands that the country’s minimum wage be substantially increased from its current NIS 3,850 to NIS 4,600 per month. What might be the consequences of raising the minimum wage and are there alternatives that might be more effective? In a country that is already not a strict enforcer of the current minimum wage, one might ask why there is a demand for a higher minimum wage rather than first and foremost a demand for more rigorous enforcement of the current minimum. In addition, higher wages might lead firms to want to employ less workers as a result of the higher hiring costs – thereby potentially leading to higher wages for those who are working, but to higher rates of unemployment among those wishing to work but unable to find jobs. This notion relating higher minimum wages with higher unemployment rates may make intuitive sense, but it has been very difficult to definitively prove or disprove empirically. However, it is nonetheless possible to focus on the relative size of the current and proposed minimum wages and compare them with a number of other barometers. 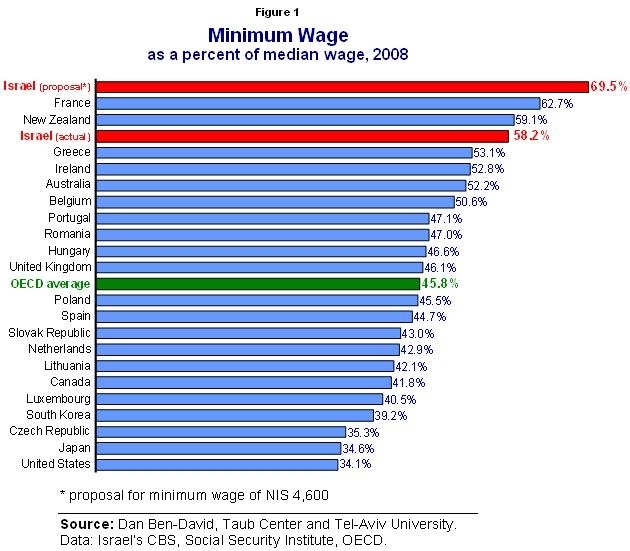 For example, how do Israel’s current and proposed minimum wages compare to other countries? An accurate comparison must take into account not only the minimum wages but also the standards of living in different countries. One measure of the standard of living is a country’s median wage. The ratio of the minimum wage to the median wage in 23 OECD countries is depicted in Figure 1. In the United States, the minimum wage equals 34 percent of the median wage. In the Netherlands, this ratio rises to 43%, while the OECD average ratio is 46%. Israel’s current minimum wage is 58 percent of the country’s median wage – with only two OECD countries, New Zealand and France, with higher ratios of minimum to median wages (59 and 63 percent, respectively). Should Israel decide to raise its minimum wage to the proposed level to NIS 4,600, then the ratio of its minimum wage to its median wage will be the highest in the western world. From a domestic perspective, is the minimum wage sufficient for raising a family above the poverty line? Figure 2 looks at the percent difference between a two-parent family’s income and the poverty line – assuming that both parents work and receive no more than the minimum wage plus a child allowance from the government for each child. In families with no children, the existing minimum wage (still in force since 2008) yields the family an income that is over twice as high as the poverty line income (120 percent higher). Families with three children receiving child allowances have incomes over 20 percent higher than the poverty line. Only at seven children does the sum of two minimum wages for each parent plus child allowances yield an income roughly equaling the poverty line. The proposed minimum wage hike increases the differences between family incomes and the poverty line for families of all sizes. The real question revolves not just on whether or not the minimum wage should be increased, but on whether this is even the best way to approach the issue of low incomes. One major alternative that has been implemented with relative success in the United States is the negative income tax – or, as it is called in the U.S., the Earned Income Tax Credit, EITC (though not the focus here, it should be noted that such a negative income tax program should be supplemented by a parallel program of upgrading education and providing professional training). In the case of a family with two parents and two children, for example, the negative income tax rate in the States is 40 percent. The attractiveness of this form of assistance is that it grows with income and becomes an increasing incentive to work. An annual income of $5,000 yields an additional $2,000 from the government in the form of a negative income tax. But if the income rises to $10,000, then the additional payment from the U.S, government rises to $4,000. Figure 3 (from the Taub Center’s State of the Nation Report: Society, Economy and Policy 2009) compares between the American and Israeli versions of the negative income tax. Both the negative income tax and the income bases are divided by the median wage to net out differences in living standards between the two countries. The primary difference between the programs is in the degree of the incentives provided by each. The United States government gives the maximum negative tax, 8 percent of the median wage, when the family’s income reaches 20 percent of the median wage. At a similar relative income level, the negative tax in Israel reaches only 1.2 percent of the median wage for families with three children or more, and even less (1 percent) for families with one to two children. In Israel the maximum amount is paid out only when income reaches 30 percent of the median wage. Not only does the negative tax begin much later in Israel, but the maximum negative tax in Israel is considerably lower: 3.5 percent of the median wage (less than one-half of the maximum negative tax in the United States) for families with 3+ children and only 2.4 percent of the median wage for families with fewer children. The differences in approach between the two countries are substantial. The American model gives more at the beginning of the process to encourage entry into the labor market and it reaches the maximum payment much more quickly. In Israel it is possible to reach the maximum negative tax level only at much higher income levels. Even when the maximum negative income tax is reached in both countries, the Israeli model’s incentive to work is considerably smaller than the American incentive. The absence of an serious negative income tax program in Israel may be more severe than simply money spent on an effort yielding minimal outcomes. Failure could lead to a decision to cancel such an expensive program altogether rather than reimplementing it properly and yielding the desired results – with all that this entails regarding the loss of an important policy tool for encouraging employment.